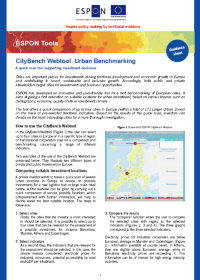 developed by CityBench - ESPON CityBench for benchmarking European Urban Zones Project. The CityBench: Urban Benchmarking is a tool to scan the potentials of European cities. It is meant as a practical tool for comparing cities and city regions based on pan-European territorial evidence produced by ESPON. It is an innovative and user-friendly tool for a first benchmarking of European cities, aimed at giving a first indication on suitable locations for urban investments based on various themes such as demography, economy, quality of life or investment climate. A first scan approach given by the CityBench will provide a first overview on where to find suitable investment locations and it enables stakeholders to gain an overall picture of the cities and regions that play an important role in European territorial development. However, deciding on the exact urban location for investment can only be done through comparing different cities through benchmarking followed by deeper analyses beyond the CityBench web tool. The CityBench focuses at policy makers and practitioners at urban level and also potential urban investor from the private sector. In addition, the tool targets the general public and should in particular benefit the non-expert users. By following short and simple steps, stakeholders can do comparisons, view similarities and complementarities, and assess advantages, disadvantages and potentials of individual cities or their own city in relation to other European cities and regions, according to a range of different indicators. Hence, this tool provides a different way of using ESPON territorial evidence, displaying information in a new and different way as compared to the standard European maps.